Click on the images in our gallery below to view Contemporary Woodgrain aluminium gates in more detail. The Contemporary Woodgrain collection covers a wide variety of classic models, from fully open and semi-open, to fully boarded styles. 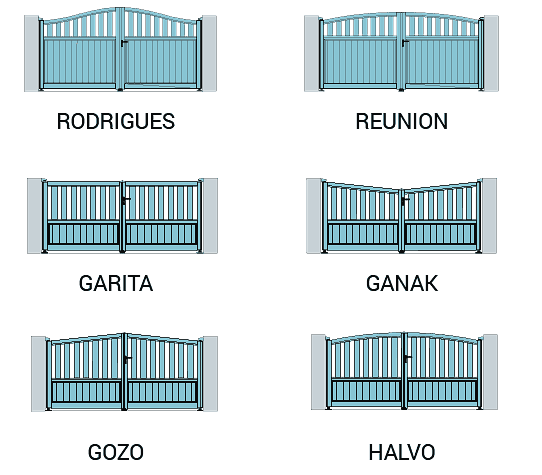 You can also choose from a wide range of shapes and create co-ordinated gates, pedestrian gates & fences. 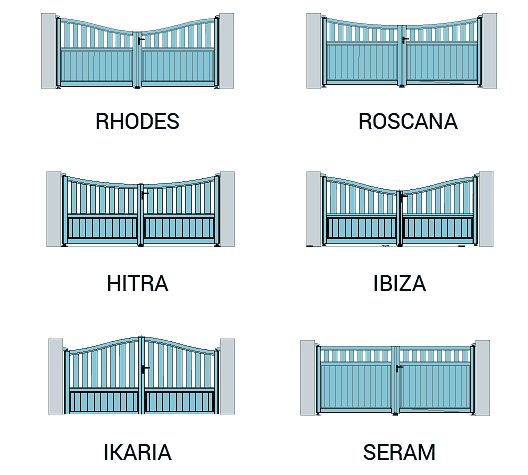 All are available as sliding gates, swing gates and cantilever gates, and you would be advised on what system best suits your requirements, by one of our experts. We have a wide choice of models in 5 different woodgrain finishes. 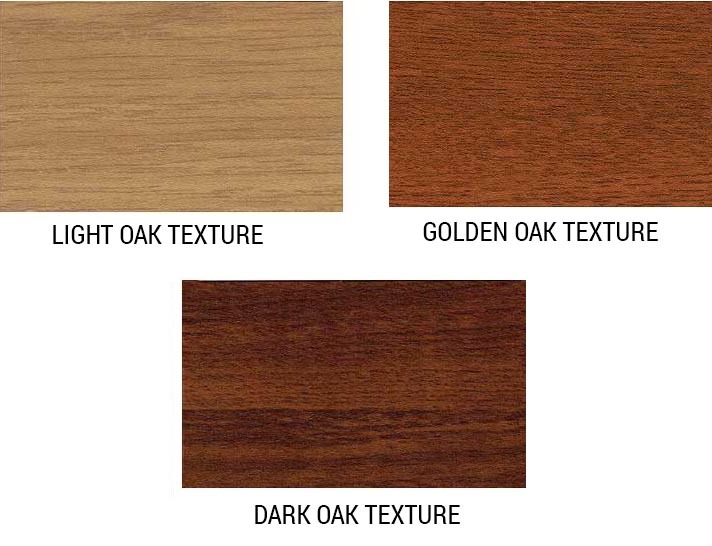 “Golden Oak” is available in a flat-gloss finish or textured to give a real timber effect and this also applies to the “Rustic Oak”, the “Irish Oak” and the “Walnut” textured finishes. 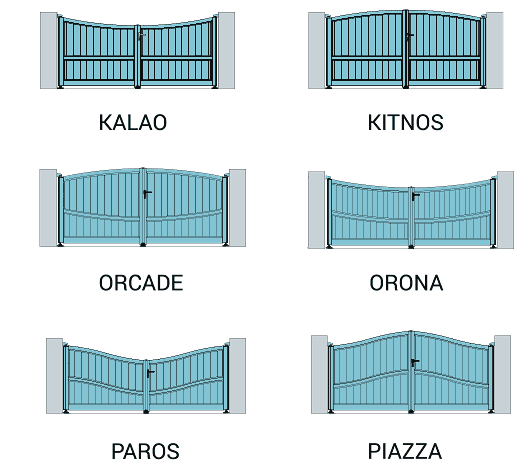 You can choose from flat-topped types, ones rising in the centre or alternatively even versions that reduce in height at the centre of the gates. To add even further choice, there are different infill profiles to personalise your design to exactly what you want. Matching fencing is also very popular with a lot of our customers, with many installation solutions such as the adjustable posts or fixing plates, to adapt to almost all wall-types. Certain styles within this range can have diagonal boards also, to give a “chevron” effect although this adds a little more cost. Whether you require your gates to be automated or just manually operated, we can advise you on a system to meet and hopefully exceed your requirements. The end result, whichever style you choose, gives you a timber-effect aluminium gate to last a lifetime, without all of the maintenance that goes with wooden gates. No swelling in winter months, warping, having to stain them regularly, you can just enjoy the look of your gates as well as having added security, for years to come. 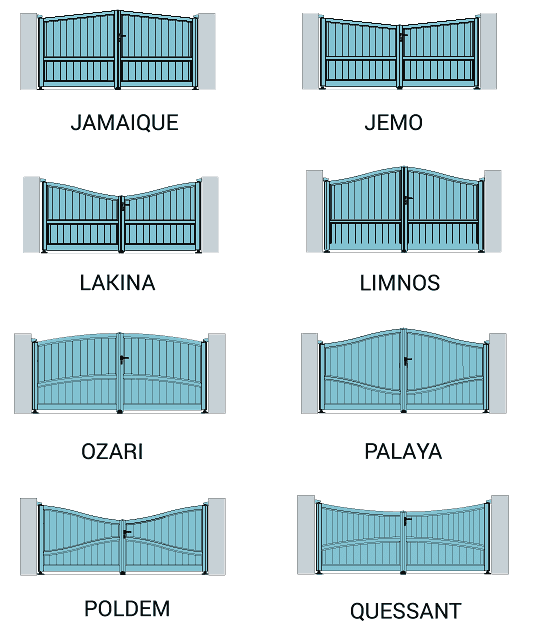 For detailed information on the Horizal Contemporary Wood Grain Collection of aluminium gates, including personalising your gate, and how to choose your ideal gate, please download our guide. Alternatively an overview of available features can be found in the tabbed area below. To start the powder coating process, a pretreatment of chemicals is applied to the raw aluminum surface, creating thin layers of amorphous oxide coating. With the use of electrostatic guns, a 2.5 micron layer of powder paint (non hazardous) is applied. Utilizing a 400°F temperature for up to 30 minutes, Polymerization is then performed. The applied base coat is conducive to creating sufficient hardness on the finalized product. Moreover, it protects aluminum against factors such as weather, corrosion, abrasion, light and humidity. In the next stage of the powder coating process, a pre-printed film transfer (containing organic photosensitive pigments and cellulose resin) is wrapped around the product. A vacuum suction system removes air, and in turn, produces a perfect thermo print. The product is placed within a specialized oven, affecting the decoration by converting ink pigments from solid, into gas and back again to solid within the paint layer. In the last step of the powder coat process, the film is removed upon cooling.